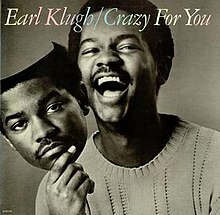 Crazy for You is the 8th studio album by Earl Klugh, released in 1981. This is the first album which Klugh produced by himself. The album received two Grammy nominations at the 25th Grammy Awards in 1983; for Best Pop Instrumental Performance, and for Best Arrangement on an Instrumental Recording, the latter shared jointly by Klugh, keyboardist Ronnie Foster, and string arranger Clare Fischer. ^ Campbell, Mary (3 May 1982). "Some call it jazz; Klugh calls it pop". Evening Herald. Rock Hill, South Carolina, USA. p. 81. Retrieved 2 October 2010. ^ Campbell, Mary (30 April 1982). "Some may call his music jazz, but he says no". The Gadsden Times. Gadsden, Alabama, USA. p. 7. Retrieved 2 October 2010. ^ Enriques, Darryl (14 January 1983). "Toto heads Grammy list". The Milwaukee Journal. Milwaukee, Wisconsin, USA. p. 23. Retrieved 2 October 2010. ^ "Vote Grammy Awards". The Washington Afro American. Washington, D.C, USA. 8 February 1983. p. 7. Retrieved 2 October 2010. ^ Baldwin, Lonna (24 October 1986). "Mellow Earl Klugh promises dynamic show". Spokane Chronicle. p. 22. Retrieved 2 October 2010. ^ Atlanta Magazine- Sep 2004 – Page "Earl Klugh is very upfront about the changes in jazz and instrumental music since he first broke onto the scene in the mid ... on Blue Note, including the classics " Dreams Come True," "Finger Painting" and "Crazy For You," his first gold album. ^ Contemporary Black Biography: Pendergast, Tom Pendergast – 2007 Page 108 " Crazy for You, EMI, 1981." ^ Contemporary Musicians: Profiles of the People in Music Julia Rubiner – 1993 "In his few years with Blue Note, Klugh produced several albums, including Finger Paintings, Living lnside Your Love, and his first gold record, Crazy for You." ^ Grammy Awards for 1982. Awesome80s.com. Retrieved 11 December 2014. ^ "Earl Klugh – Billboard Albums". allmusic. Retrieved 2 October 2010.